Squid ink noodles at Porto. Last year, a few months after co-owner and chef Jody Adams and the team from Trade opened their lively, suave Mediterranean-on-Back Bay restaurant Porto, I waddled in to review the place. Adams was perched at the bar. It was October — four months and one chef de cuisine ago. Eataly, lurking in the Pru next door, wasn’t open yet. Rialto, long Adams’s flagship, had closed upon her departure in June. I ordered a special fall cocktail that was prepared tableside. A few minutes later, the cocktail cart arrived bearing a small log with an ax plunged into the bark. The ax had a little built-in pipe, and a server set about burning herbs to add fragrant smoke to my glass. Alas: The cart was devoid of glasses. The room began filling with smoke as the staff frantically ran around, and the bartender turned bright red. Like a lot of things at Porto, the cocktail cart is a little better now. This month, the cart pulled up to my table with two different aged rums and delivered a daiquiri that maintained the drink’s trademark tartness but added several layers of complexity. Dragging the bartender into the middle of the room to do tricks like the chef at a Mongolian barbecue is still a godawful affectation. But the drink was good, and there was no chance of burning down the building. More than six months into Porto’s run, Adams — along with co-owners Eric Papachristos and Sean Griffing and recently added chef de cuisine Andrew Hebert — has steadied the ship somewhat. The deceptively spacious dining room, next to Saks Fifth Avenue in one of the city’s highest-rent districts, is a stunner. Subway tile lines the long open kitchen; macro photos of seafood hang on poured concrete walls; the dark, glassed-in front room can be bustling and even uncomfortably loud, while the main dining room offers a warmer, cozier vibe; a long L-shaped counter rings the kitchen, and a separate bar overlooks the street. And an elegant patio offers A+ people-watching opportunities in the summer. Owing perhaps in part to Adams’s long track record, the crowd seems to skew slightly older, and some stop to greet Adams — still watching from the bar during one recent dinner service. The restaurant is named for the Italian and Portuguese word for “port,” and the menu focuses on fish in its many forms; it excels with Mediterranean-inspired meze plates, raw and cooked, cold and hot. A crudo of fresh scallops displays precise knifework, and a dice of briny, crunchy nicoise olives offsets the sweet shellfish. Clams and guanciale — cured pork jowl — swim in a rich, fennel-seasoned broth that will have you searching for a spoon once the bread has run out. Crunchy, cornmeal-dredged oysters and a bright preserved-lemon aioli complement each other perfectly. Grilled octopus is omnipresent these days — good thing they have so many tentacles, I guess — but Porto’s version is anything but perfunctory. 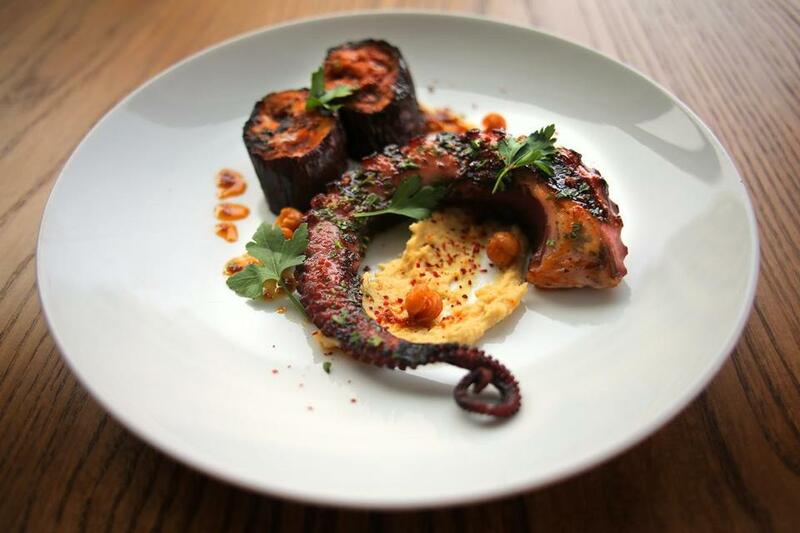 Mining the southern coast of the Mediterranean for flavor, the perfectly tender, lightly charred cephalopod is surrounded by chickpeas (whole and hummused) and hunks of eggplant and enlivened by harissa. Pasta dishes, made in house, are also standouts. 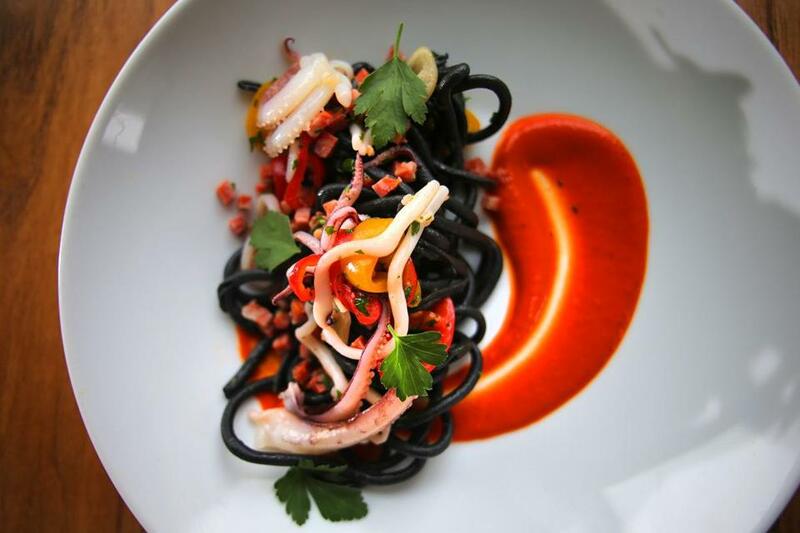 Squid ink noodles, sometimes a pointless gimmick, here redeem the whole black-pasta genre, tossed with delicate squid, chorizo, and peppers (an earlier incarnation, no longer on the menu, added a bright citrusy tang that made it even better). 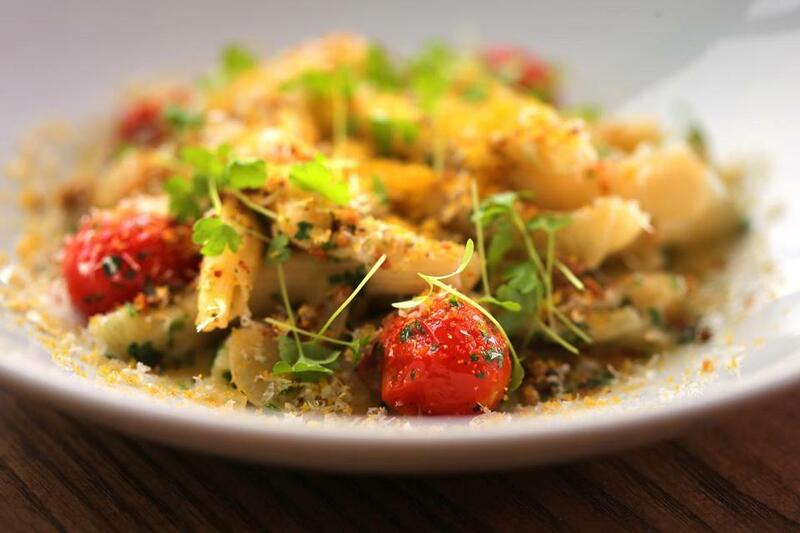 Delicate campanelle pasta, studded with roasted cherry tomatoes and covered with bottarga — cured, grated fish roe — would make for a good main course if it doubled in size. That wouldn’t be a bad idea, because Porto, even now, is afflicted with the same disease that plagues so many otherwise excellent restaurants: The wonderful small plates are more exciting and better executed than the main courses. Whether this is a terminal case remains to be seen. The entrees on Porto’s refreshed menu are indeed more interesting under Hebert, who worked with Adams at Trade and Rialto before gaining experience in kitchens all over the country. Pan-seared monkfish, matched with Brussels sprouts, raisins, and pine nuts, is moist and flavorful, served with a swatch of squash romesco (apparently anything can be a romesco now). 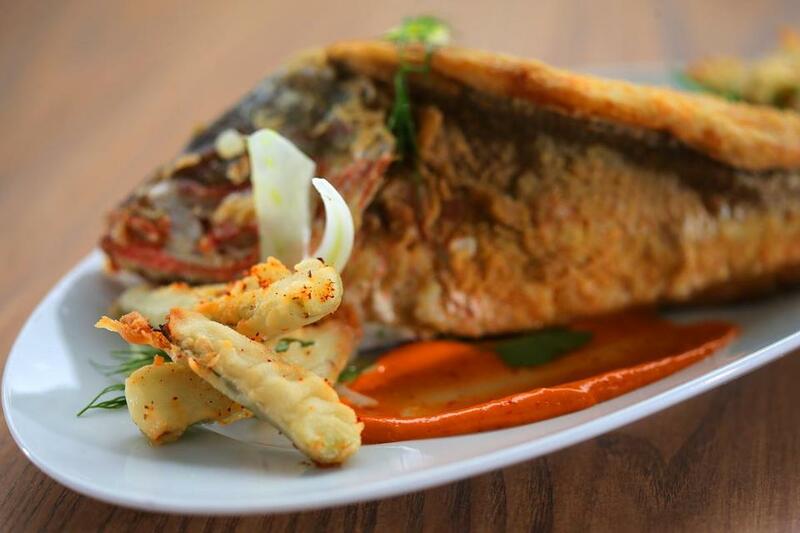 Whole fried fish is crisp and tender and meaty — a snap to take apart and eminently shareable. Though the accompanying pool of aioli flavored with Aleppo pepper runs a few shades too salty, it’s easy enough to dip into it sparingly. And fish stew, with a beautifully cooked cut of hake at its center and mussels, squid, and white beans swimming in a fragrant broth, is more cohesive and satisfying now. But a massive boneless rib eye that should be a showstopper at $60 is instead marred by bad butchering. Imagine preparing a rich, bright sherry reduction, grilling and trimming a slab of beautiful romanesco, dotting the dish with black garlic and shaving a mortgage payment’s worth of truffles over the whole thing, only to spend the next half-hour chewing and hacking at connective tissue that shouldn’t be anywhere near a properly butchered rib eye. And what to do with a pallid, gray confit duck leg — served with duck and pork sausage and a tasty fried cube of mashed sweet potato — that has been salted beyond all reason? After three visits of entree ennui, we’ve chosen to share three main courses among four people and pile on the small plates. If I was stuck with the duck all to myself, I’d be chugging water straight from the sturdy glass decanter on the table. By the fourth visit, I’m totally convinced that the way to best enjoy Porto is to stick mostly to the small plates. Servers, warm and accommodating, and quick with clear recommendations, won’t dissuade you from that approach. The bar is inventive and competent. The Greek negroni subs out every ingredient in a classic negroni but somehow succeeds in appropriating the idea with unusual flavors; to create a drink called Le Parfumeur, the bar infuses mezcal with black pepper and mixes it with good vermouth and a high-test version of the artichoke amaro Cynar, then cuts the heat with lemon and lavender. Desserts run from satisfying to strange. Chocolate Om Ali, an Egyptian bread pudding made with coconut and coriander, is hot and sweet and melty; a cylinder of intense chocolate mousse in a pool of vibrant cherry syrup is easily enough for two. But get all the way out of here with a recent affogato, which asks an otherwise sane person to pour hot espresso over a fruity scoop of delicious, deep red sorbet, thereby ruining both. Few area chefs have done as much to earn a loyal following as Adams. But whether the loyalists who flock here will find what they’re looking for is an open question. For all the grace and skill on display — on plates, in glasses, and all over the dining room — Porto can seem confoundingly adrift. Ring Road, Back Bay, Boston, 617-536-1234, www.porto-boston.comAll major credit cards accepted. Wheelchair accessible. Prices Small and raw dishes $8-$17. Main courses $28-$60. Desserts $7-$12. Hours Mon-Thu 11:30 a.m.-10 p.m., Fri-Sat 11:30 a.m.-11 p.m., Sun 11:30 a.m.-9 p.m.
What to order Raw scallop, barrel-aged Greek feta, fried oysters, clams, octopus, pan-seared monkfish, chocolate Om Ali.